Suspected Islamist militants in north-east Nigeria have killed at least nine school children, the second targeted attack on students in recent days. Gunmen believed to be from the Boko Haram group opened fire on the pupils, who were in school uniform, at a school on the outskirts of Maiduguri. Boko Haram said the attack was to punish youngsters for helping the army. Some survivors said it was a response to the emergence of vigilante groups in the town. North-eastern Nigeria is under a state of emergency as the government tries to defeat an Islamist insurgency. Witness Ibrahim Mohammed said he was taking exams in a classroom at Ansarudeen School when gunmen stormed the building. "I saw five students sitting the exams killed on the spot," he said. "Four others were killed as they were entering the school premises." Hospital workers confirmed that the bodies of nine children, still in their uniforms, had been taken to the mortuary in Maiduguri. A spokesman for Boko Haram handed a message to local journalists saying that the attack was to punish youngsters for assisting the army. 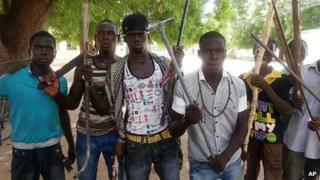 The BBC's Will Ross in Lagos says vigilante groups have been springing up in Maiduguri with young men wielding metal pipes, clubs and machetes handing suspected militants over to the army. A military spokesman said all those handed over would be given a fair hearing. However, with hundreds of people being held in detention and few ever coming to court, there is a danger that the vigilante groups could be used to settle scores, our correspondent says. On Sunday, a school in Damaturu was attacked by suspected Boko Haram gunmen and 13 people including students and teachers were killed. Nigerian President Goodluck Jonathan imposed a state of emergency on north-east Nigeria last month and thousands more troops were sent to fight the Islamist militants. So far there is no evidence to suggest that large numbers of Boko Haram fighters have been killed, our correspondent adds.